As we slowly approach Mobile World Congress, rumors about the release of the new Galaxy S8 handset continue to stack – and the latest allegedly gives us our first glimpse of Samsung’s upcoming flagship device. GSMArena has obtained a leaked photo that purportedly shows the forthcoming Galaxy S8. In line with previous speculation, the phone appears to have no home button and a curved screen with very little bezel. Perhaps less expected – and certainly more alarming – is the apparent lack of on-screen keys. 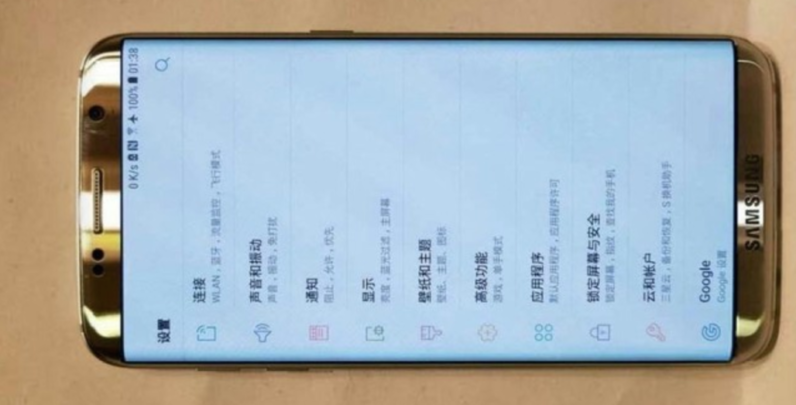 The South Korean manufacturer has reportedly begun testing its upcoming flagship smartphone in China, which would explain the Chinese setup – but this hardly qualifies as actual evidence. Indeed, there are plenty of clues to suggest the picture is fake. While early rumors hinted Samsung might pull off an Apple and ditch the headphone jack on the S8, the leak clearly shows there’s something closely resembling a standard audio port in the bottom left corner of the leaked phone. As is often the case with such leaks, the authenticity of the picture remains uncertain. Given the striking resemblance it shares with previous Samsung models, it is not entirely out of the realm of possibility that the leaked photo is a very compellingly photoshopped Galaxy S7 mockup. While the South Korean phone-maker has repeatedly refused to deny or confirm any speculation of its upcoming flagship handset, the Galaxy S8 is slated to make its debut at MWC later in February.